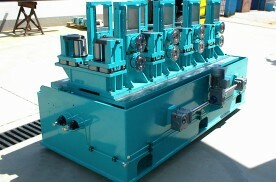 Manufacturing custom machines - Brunner Ltd. The main scope of activity of Brunner Ltd. is manufacturing custom machines, especially ones which cannot be manufactured elsewhere due to their complexity or large size. We are able to implement your ideas for your custom machine based on a blueprint or our own design. The development and manufacturing of the prototypes is a very complex process, since the number of participants in the process is typically high, their professional background is very diverse, and those factors don’t always help. To manufacture the prototype you need deep professional knowledge and a close-knit team, just like us. We manifest your ideas and build custom machines based on technical designs. If there is no technical design, we are able to create one together with the engineering offices experienced in the specified industry, so we are able to carry out the whole process from the designing through manufacturing and certifying. Our production process includes – if necessary, the designing – acquisition of raw material and other commercial products/parts as needed, the flame and plasma cutting during manufacturing, the milling, turning, grinding on conventional and CNC machines, the surface treatment of parts, heat treatment, the painting of complete equipment, electric and hydraulic design, and installation. Our main target is to continuously increase the satisfaction of its customers.